Paul Van der Werf of Earthan Group designed the integrated garden and then Paul and I built the Garden at RFBI Basin View Masonic Village back in December 2011. 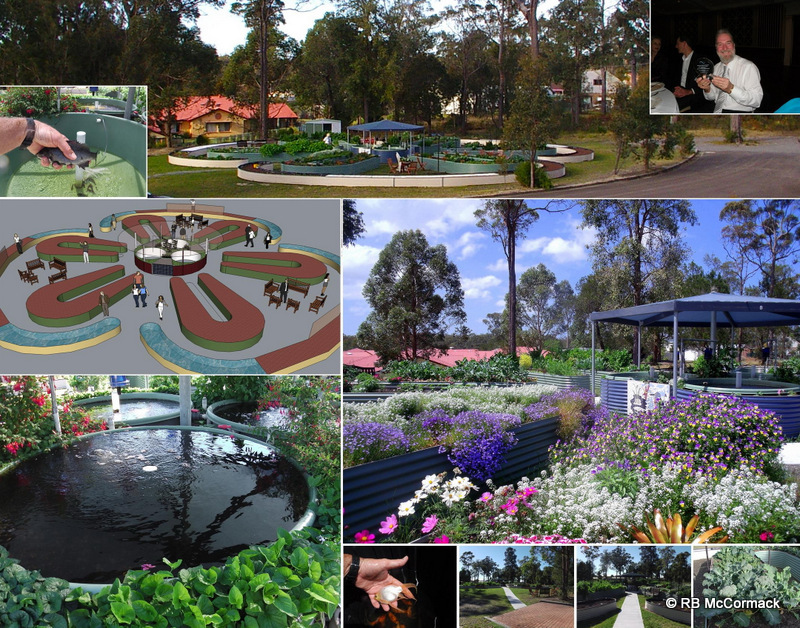 The gardens have central aquaculture tanks growing silver perch for food and gold fish for visual pleasure with the nutrient rich fish water being recirculated under the gardens to provide a nutrient source for the vegetables and flowers. Water flows constantly under the garden beds so the plants are self watered reducing the elderly residence’s maintenance requirements. The nutrient rich garden beds are raise so they are at a comfortable height, are narrow so easily reached from each side and set out in a maze type pattern so some memory required to navigate and locate your garden plot within the larger garden. Since completion the gardens have flourished being the subject of praise from all quarters, and a number of scientific studies commissioned on the health benefits of the gardens for the Retirement Village Residents. As a result of the these studies the latest good news is that the garden has been nominated for a prestigious International Academy of Design and Health Award. The International Academy for Design & Health is a global, interdisciplinary knowledge community dedicated to the stimulation and application of research concerning the interaction between design, health, science & culture. Luckily Brisbane was hosting the 9th Design & Health World Congress & Exhibition, from 10-14 July. Paul and I attended the Gala dinner and awards Ceremony being held at the Brisbane City Hall. It was my first time in the Brisbane City Hall which had just undergone it $215 million 3 year renovation. Judging panels from across the global made their recommendations for this year’s winners, resulting in Paul’s gardens winning a Salutogenic Design Award. The criteria for this Award is for the design of a completed project of any typology, which is comprehensible, manageable and meaningful, thereby fostering a strong sense of coherence amongst its users that promotes their health and wellbeing. Submissions must show how environmental, social and economic sustainability is improved. The garden we built did all this resulting in the prestigious award. Well-done Paulie! Paul and I have been researching a number of dwarf group crayfish and we are preparing a large number for publication over the coming months/years. The first in this series was recently published in the Memoirs of the Queensland Museum. The paper documents the extended distribution of E. Urospinosus to include rainforested streams draining both sides of the Conondale Range into the Mary and Brisbane Rivers. We document our survey results and records information on the species ecology and discuss it’s conservation status. This type of research that increases the knowledge base on crayfish species is essential, it gives our management agencies the science they need to make informed decisions and promotes the species conservation. McCormack, R.B. & Van der Werf, P. 2013 06 30. 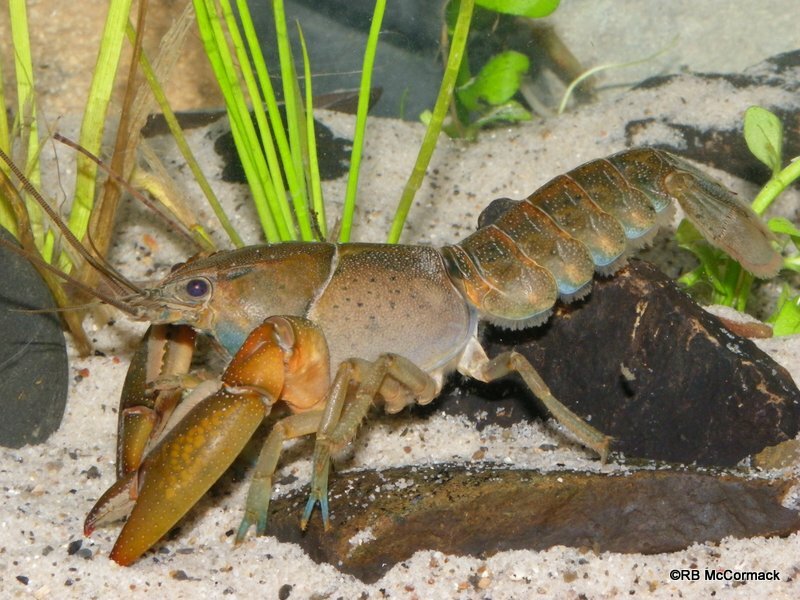 The distribution, ecology and conservation status of Euastacus urospinosus (Crustacea: Decapoda: Parastacidae), a dwarf freshwater crayfish from the Mary and Brisbane River drainages, south-eastern Queensland. Memoirs of the Queensland Museum — Nature 56(2): 639–646. Brisbane. ISSN 0079–8835. The spiny cray book is selling nicely with lots of positive feedback. My thanks to the hundred or so people that have personally given me positive feedback. Only one winger so far, that was a bit disappointing but such is life. The book is designed to increase the profile of our Euastacus crayfish and raise awareness of the beauty and unique biodiversity of our Australian Freshwater Crayfish. The book has been nominated for a prestigious Whitley Award. 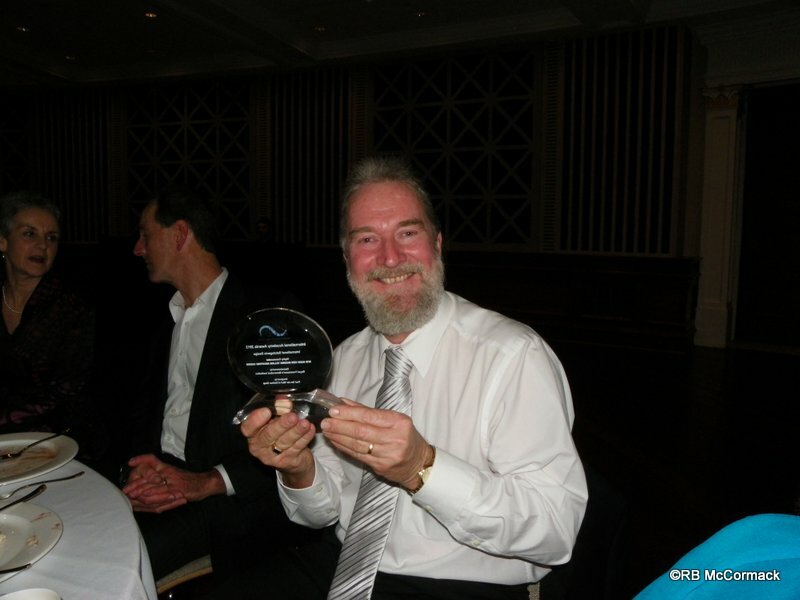 The Whitley Awards are awarded by the Royal Zoological Society of New South Wales (RZSNSW). The Royal Zoological Society of New South Wales is a non-profit, scientific organisation dedicated to the study and conservation of native Australian fauna. Whitley awards are presented for outstanding publications, either printed or electronic, that contain new information about the fauna of the Australasian region. Fingers crossed that the book actually wins the award, there are some fantastic publications out there so lots of competition. Even if it doesn’t win it’s good to know that others appreciate the effort to create and the substance of the book and have nominated it. 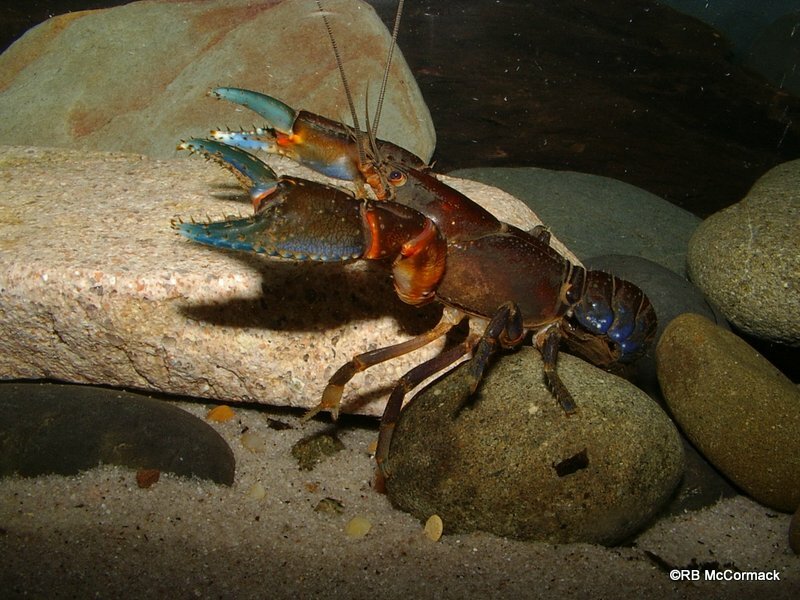 Euastacus dharawalus is a rare and critically endangered giant spiny group crayfish from the Fitzroy Falls region of NSW. 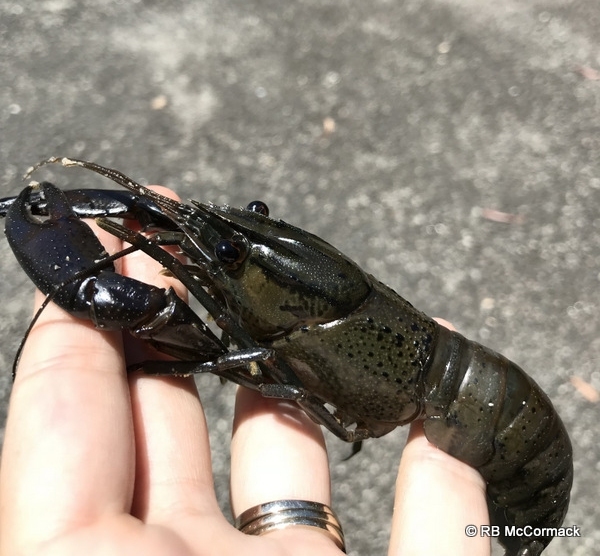 The Australian Crayfish Project (ACP) has been conducting studies on this species since 2006 when we first discovered invasive crayfish in the area. 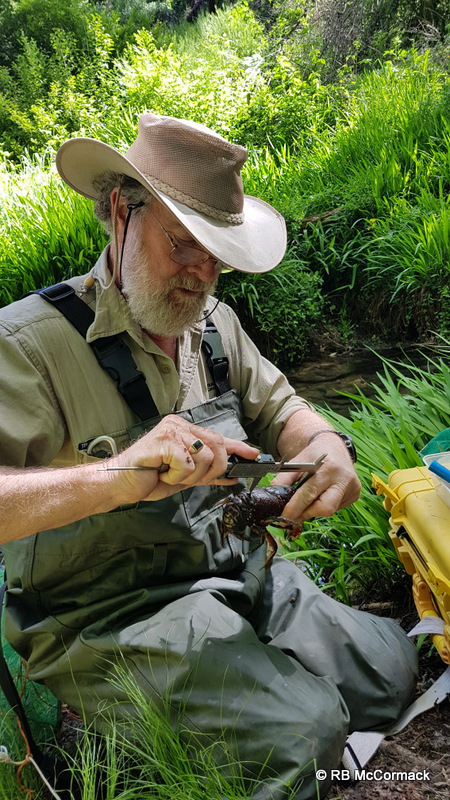 Since 2006 we have been extremely concerned with the future of this crayfish species and believe it may be the first Euastacus to become extinct. We have been writing this paper ever since and finally we have completed our studies and now the paper has been published by Journal of Crustacean Biology. I’m a member of the Crustacean Society who publishes The Journal of Crustacean Biology, and I recommend anyone interested in crustaceans join up www.thecrustaceansociety.org/ The mission of the Crustacean Society is to advance the study of all aspects of the biology of the Crustacea by promoting the exchange and dissemination of information throughout the world. As a result of the ACP research the NSW Fisheries Scientific Committee, has made a final determination to list the Fitzroy Falls spiny crayfish, Euastacus dharawalus as a CRITICALLY ENDANGERED SPECIES. That’s the first Euastacus species to be listed as critically endangered by any state or the federal Government in Australia and a great win for the ACP. New records and review of the translocation of the yabby Cherax destructor into eastern drainages of New South Wales, Australia is in press. This is the second paper we have prepared on invasive Cherax destructor into eastern drainages of NSW. 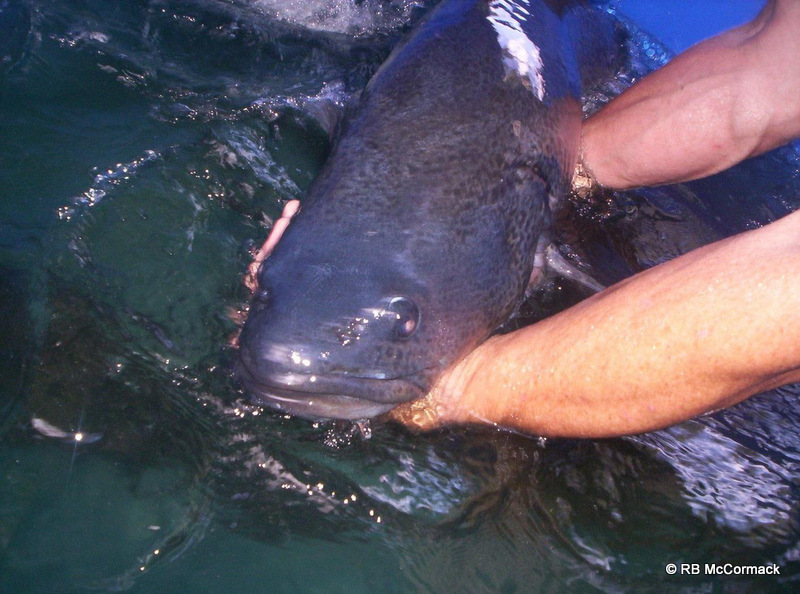 The original paper in 2009 documented 20 translocation sites. This new paper builds on the original and documents over 50 new translocation sites. 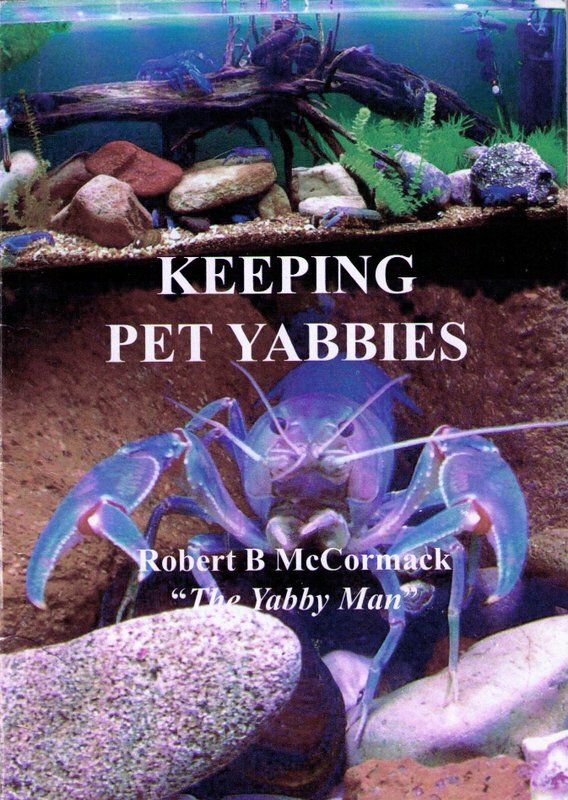 Yabbies are a fantastic species when in their own environment but when they are translocated into new catchments they can have dramatic negative repercussions on the endemic species so become an ecological nightmare. 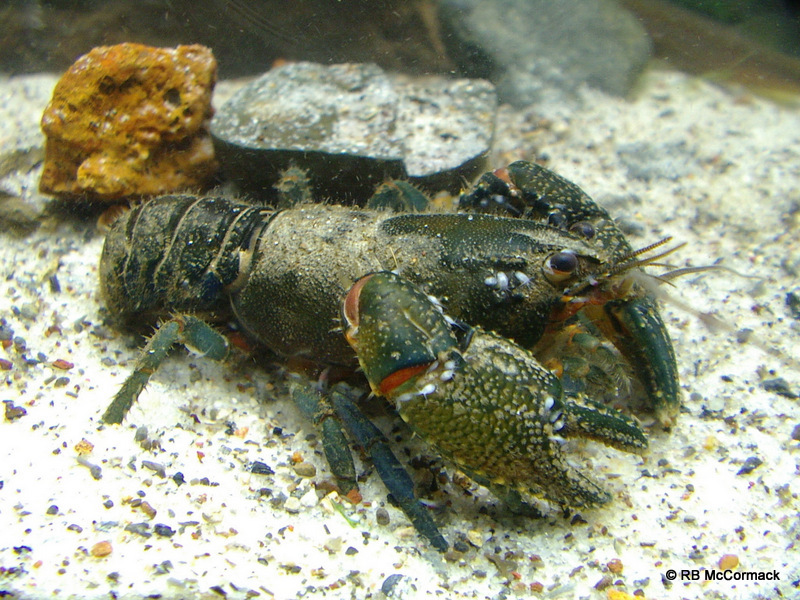 The papers highlights the negative impacts on endemic crayfish species, it’s in press and should be published soon. Mohamed bin Zayed Species Conservation Fund Project Number 12054688. • Determine its conservation status with recommendations for listing at a State/Federal level. Since March 2013 we have been biological surveying the coastal strip of the Port Macquarie-Hastings LGA. It’s been an interesting survey with a number of crayfish species being identified. Cherax cuspidatus is the predominant species with E. Dangadi, E. Spinifer and E. Reductus being found in the coastal mountain streams. The project is entering the final stages with the final report in preparation and due for submission in October. This was a very important project that is fundamental to a number of further research projects. The Coastal strip of NSW has two endemic Genera of small freshwater crayfish (Gramastacus and Tenuibranchiurus). The ACP is researching both species and this Hastings-Port Macquarie project has added significantly to those two projects. The ACP is also researching Cherax cuspidatus and the project area is the southern most distribution area for the species. The results have contributed significantly to our C. cuspidatus project and a paper is currently in preparation: Taxonomy, distribution and ecology of the cusped yabby Cherax cuspidatus (Riek 1969). Robert B McCormack, Peter J F Davie and Dean R Jerry. Additionally, the information gathered from this project will contribute to the wider paper on the distribution of the eight Parastacidae species of the Hasting River Drainage. 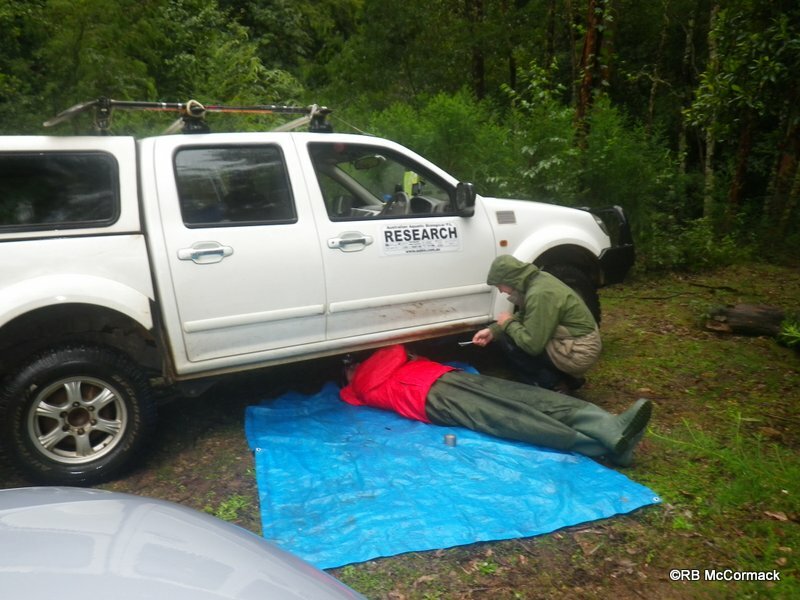 Australian Aquatic Biological was successful in winning another Gosford City Council Ecological Research grant. 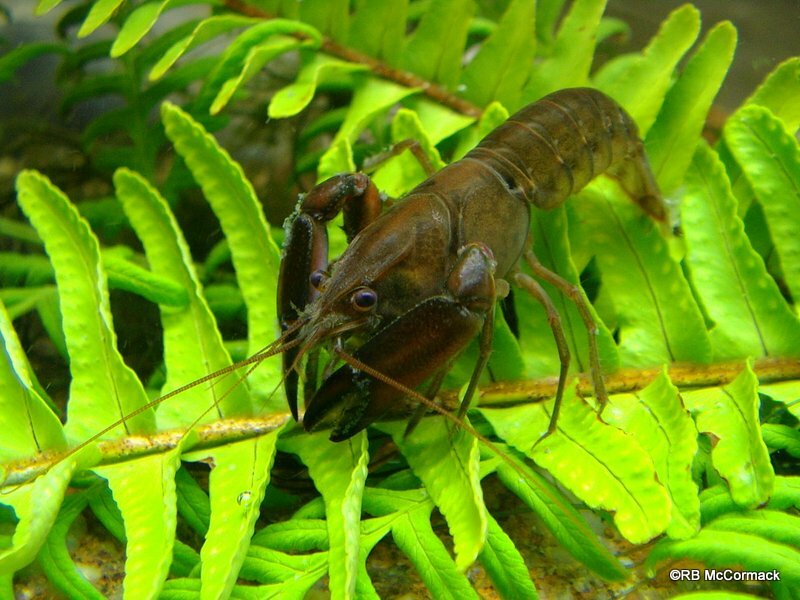 The project will concentrate on the biology, distribution and abundance of Gramastacus crayfish and invertebrates in the Avoca and Cockrone Lagoon freshwater ephemeral habitats, with the project starting at the end of August 2013. Southern Rivers Catchment Management Authority is major sponsoring this project which is approaching fruition. The information collected on the aquatic biodiversity from the high altitude feeder stream right down to the saltwater estuary is all included within the final project report. Additionally, the survey has resulted in a huge amount of data being collected on both Euastacus spinifer and Euastacus yanga. 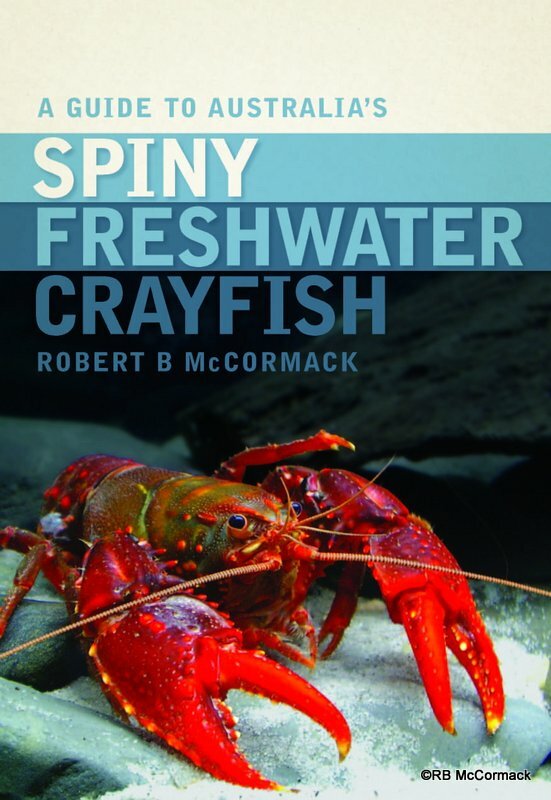 Information on their ecology, biology and distribution will be documented in a paper titled: McCormack RB and Crass D. New records and review of the distribution and ecology of freshwater crayfish (Crustacea, Decapoda, Parastacidae) of the southern catchment of the Clyde River, New South Wales, Australia. This paper is currently in preparation and we hope to have it published later this year. Coffs Harbour City Council coastal Survey. 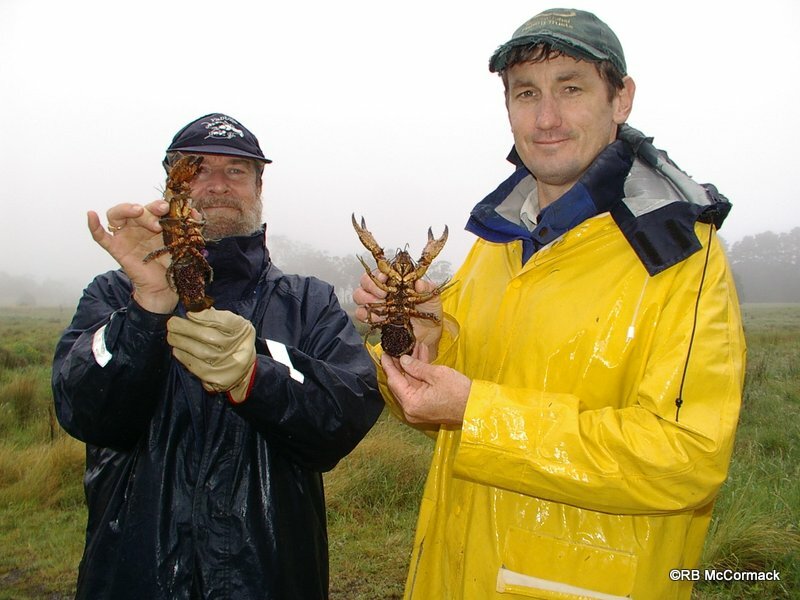 Tenuibranchiurus crayfish are rare and endangered crayfish in NSW. The species we have in NSW are a new unnamed species that we know very little about. We don’t have any biological or ecological information and little or no idea of where the species occur. To help fill these enormous knowledge gaps the ACP has been researching the whole northern NSW coastal strip. As part of the broader project the ACP has received an ecological research grant from Coffs Harbour City Council to biologically survey their coastal strip. Crustacean species are abundant in the area with an enormous biodiversity which makes the surveying very exciting. One of the stranger crustaceans we collected was a freshwater crab that was found with riffle shrimps Australayatya striolata and the small spiny crayfish Euastacus dangadi. I didn’t recognise the species as it’s not something ever captured before in NSW. 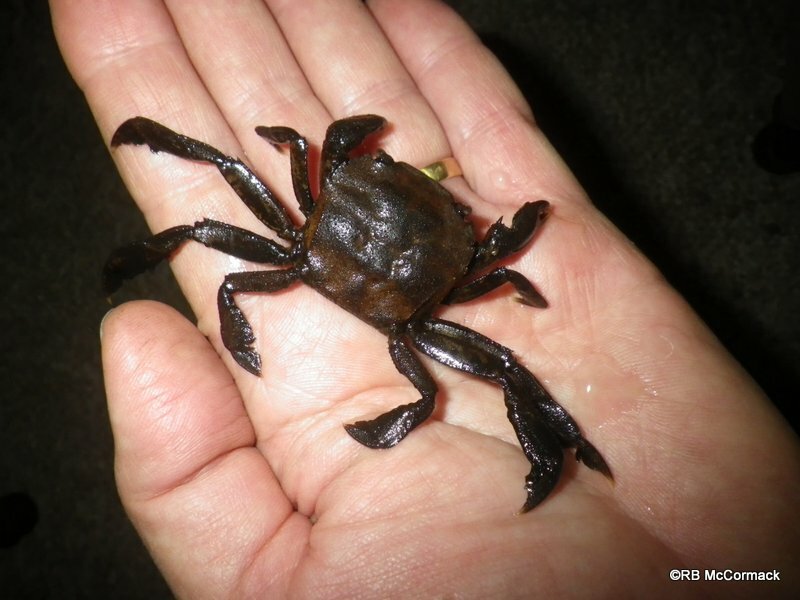 I immediately went to Australia’s crab expert, Peter Davie of the Queensland Museum and he set me straight, it’s a River Swimming Crab Varuna litterata. Its a tropical species previously only ever recorded as far south as south east Queensland this is the first time it’s ever been recorded in NSW. An unexpected but most welcome surprise. (Seems the east coast current has delivered another new species to NSW). 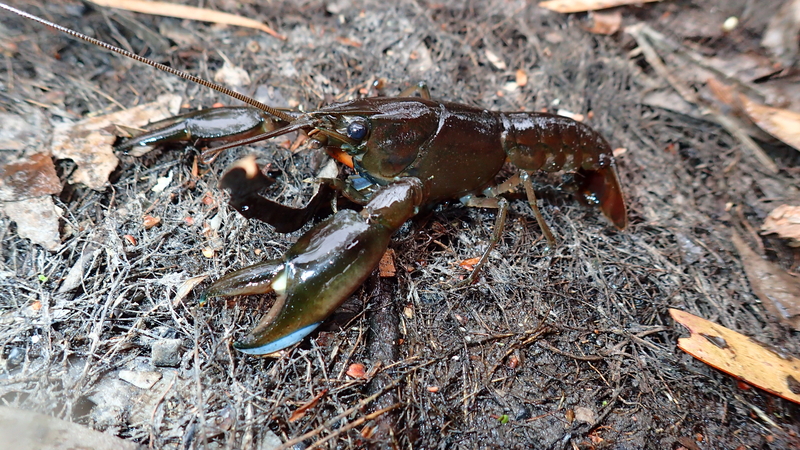 The eastern swamp crayfish Gramastacus sp. 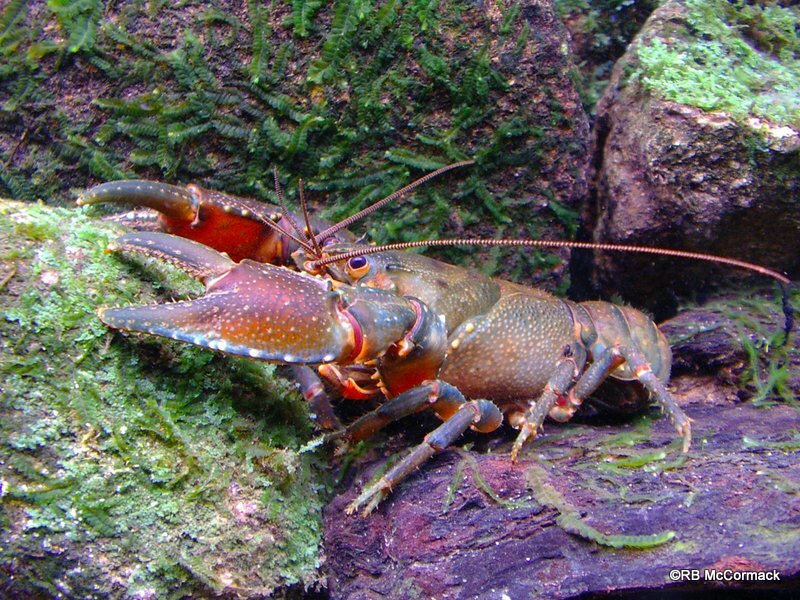 nov. (Decapoda: Parastacidae) a new species of freshwater crayfish from coastal New South Wales, Australia is in press. The description of a new Gramastacus species from coastal NSW is currently in press. Hopefully in a short period this new species description will be published. Its an endangered species that occurs in the fastest developing coastal region of Australia (found from Gosford to Forster) and is seemingly critically endangered and heading towards extinction in some catchments. Once we get a name for the species future research will then be directed towards its conservation. 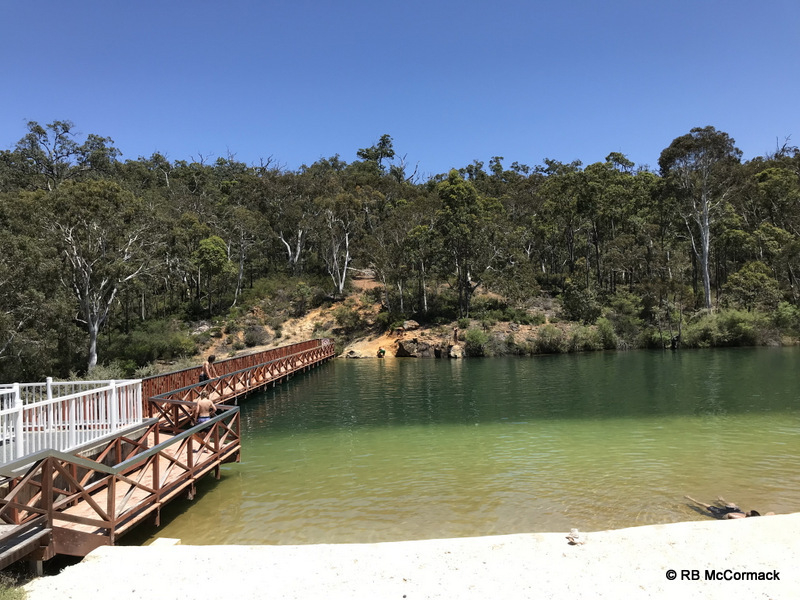 Australian aquatic Biological and its subsidiary RBM Aquaculture has had another extremely busy year with numerous consultations. 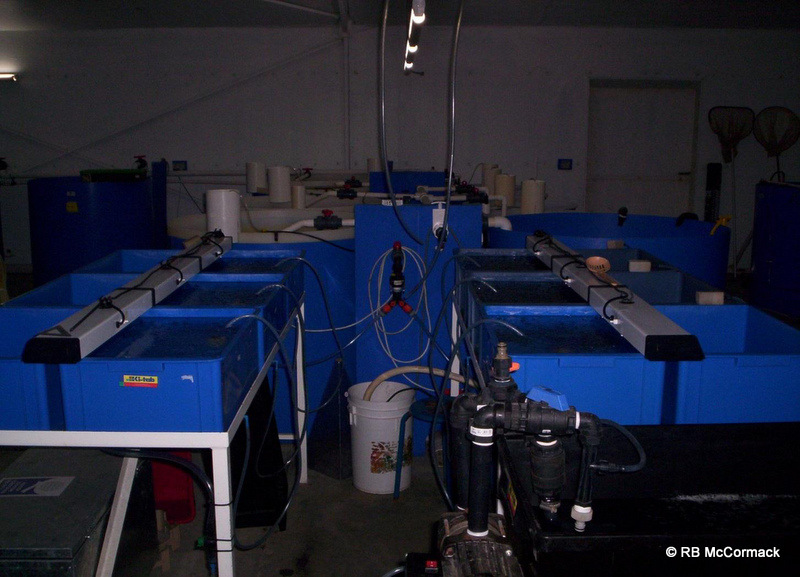 We designed and assisted with approval for a new Redclaw crayfish (Cherax quadricarinatus) Farm in Queensland this year. 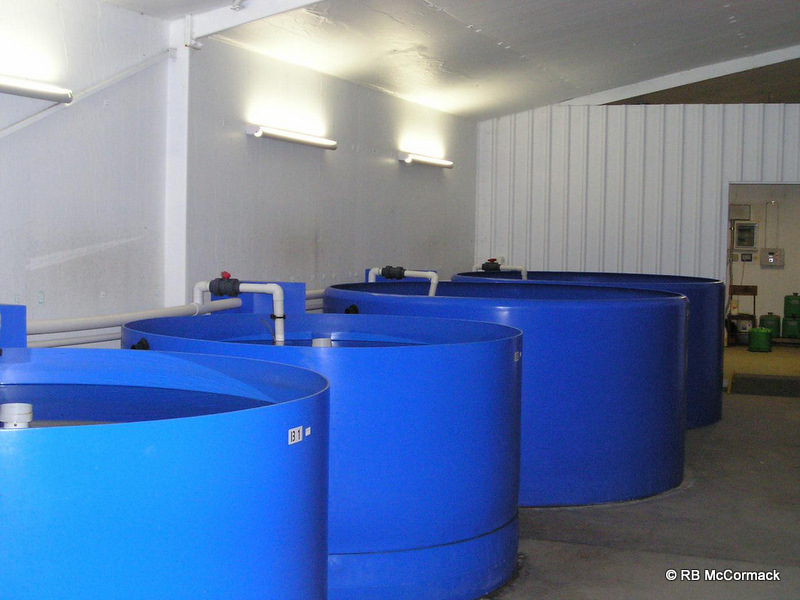 Interest in Redclaw aquaculture continues to grow in Queensland with continued investment. We designed a new aquaculture facility with 12 nursery ponds (25 x 10 m), 35 growout ponds (50 x 20 m), 4 sediment ponds (75 x 20 m), plus a water storage dam and purging facilities, etc. This consult was successfully completed this year with approvals from DAF, DSDMIP and Council being granted. Consultation with a new Murray Cod farm just over the border of NSW in Victoria was completed this year. This consult also provided the opportunity for a holiday in Victoria for the wife (Cheryl), the family dog (Binx) and myself. 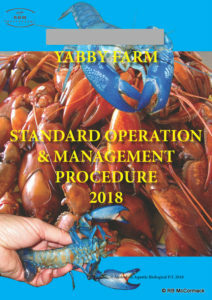 We designed and assisted with the licencing of a new Yabby (Cherax destructor) Farm in NSW. 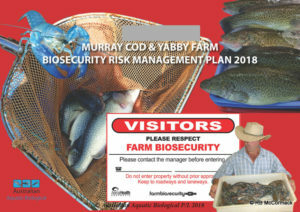 NSW DPI instigated a new regulation this year requiring a Farm Biosecurity Risk Management Plan to be created, submitted and approved prior to aquaculture permits being granted. This was something new from NSWDPI and over the year we generated a number of plans but each time they were rejected and the department required greater information. The problem was that DPI didn’t have a template or much direction and being the first to submit a plan we became the test case. We worked with DPI on not just this biosecurity plan but others as well for our other clients and finally this project was completed with approval granted and aquaculture permit issued. 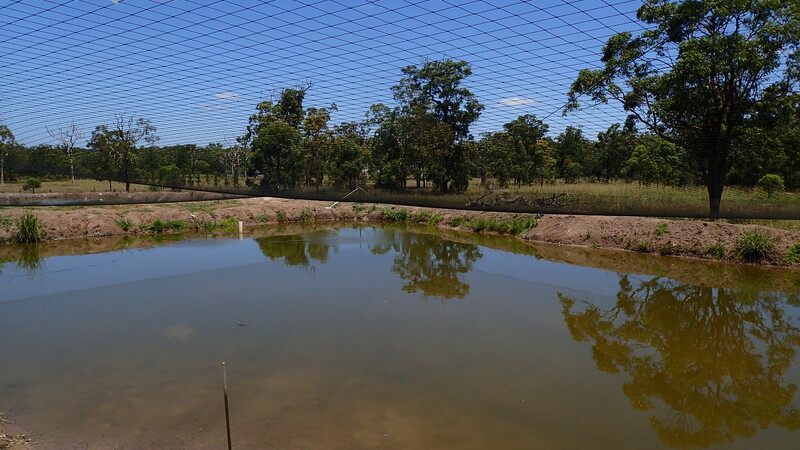 We designed and assisted with a new Yabby (Cherax destructor ) and Silver Perch (Bidyanus bidyanus) Farm in NSW this year. This facility has 19 growout ponds (50 x 20 m), 2 sediment ponds (75 x 20 m), water storages, irrigation areas and purging facilities etc. 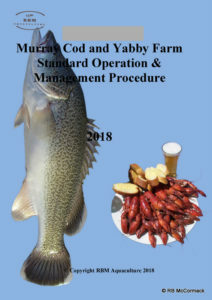 Pre approval from NSW DPI Fisheries has been granted but this consult is ongoing into 2019 as it was submitted to council in December 2018. 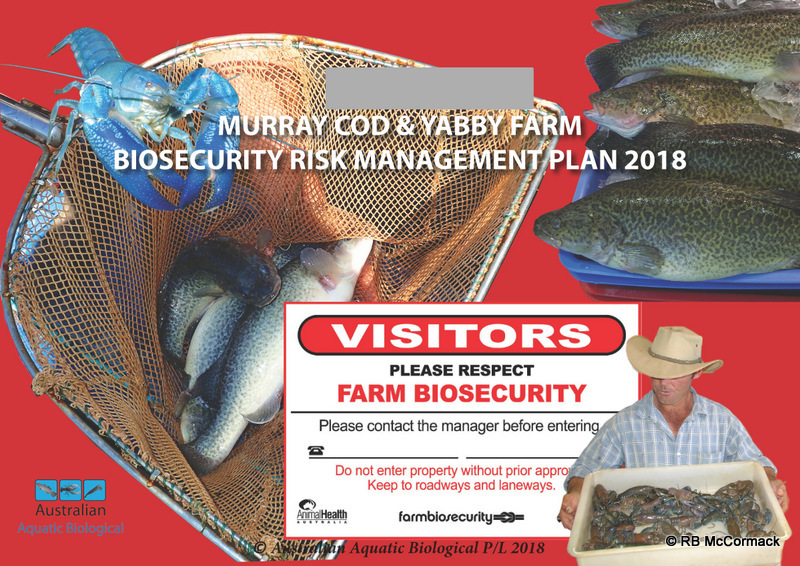 We have designed a new Murray Cod, Silver Perch, and Yabby Farm for NSW this year. It’s in the developmental stage at the moment with designs, applications, SOMP and Biosecurity Plan created but this project will be ongoing into 2019. Long term consultancy with the Queensland Government has continued throughout the year. AABio has been engaged to supply expert opinion on freshwater crayfish and land based aquaculture to the Qld DSDMIP and DAF. This consultancy is ongoing and will continue in 2019. Long term consultancy with Jamie Williams of Yabbydabbadoo Yabby Farm was terminated in early November 2018. Basin View Gardens. 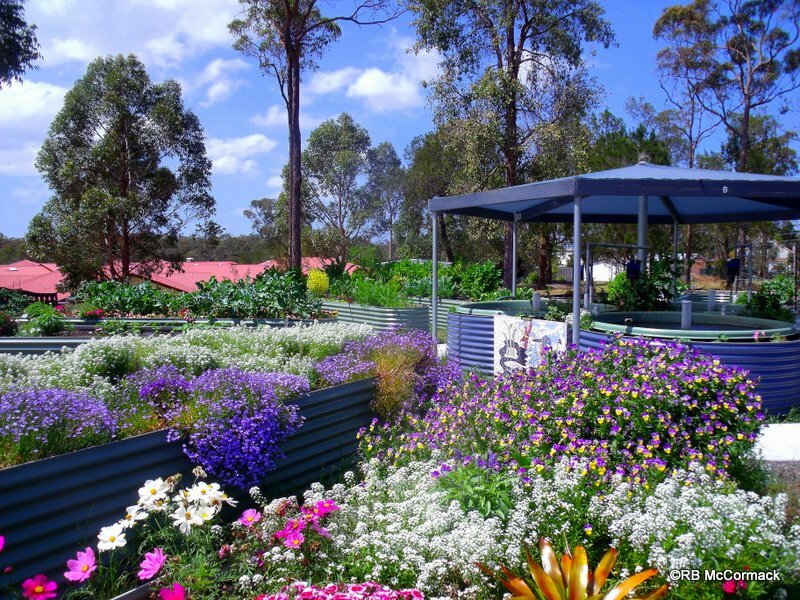 Regular services and support for the Royal Freemasons’ Benevolent Institution’s award winning aquaponic garden at Basin View, NSW has continued this year. Paul Van der Werf designed the integrated garden and then Paul and I built the Garden at RFBI Basin View Masonic Village back in December 2011. Since completion the aquaponic gardens have flourished being the subject of praise from all quarters, and a number of scientific studies commissioned on the health benefits of the gardens for the Retirement Village Residents. At the time this was the largest aquaponic garden in the southern hemisphere and won an International Academy of Design and Health Award. The International Academy for Design & Health is a global, interdisciplinary knowledge community dedicated to the stimulation and application of research concerning the interaction between design, health, science & culture. Since construction AABio has conducted regular service and maintenance of the garden. Significantly this year, the last of the Silver Perch were removed from tank 3 and replaced with ornamental fish (Koi & Goldfish). The ornamental fish supply a better visual stimulation for the village residents compared to the silver perch that only became clearly visible at feeding time. Our thanks to my mate Craig at Albatross Aquaculture for the supply of all our ornamental fish. The garden continues to supply high quality organically grown leafy greens and vegetables for the residents, the hostel kitchen and excess for fetes, etc. Numerous other smaller consultations have also been completed. Plus long term consultancy with a number of our previous major clients continued throughout the year. Blue Mountains City Council (BMCC). Another year of monitoring streams and crayfish populations for BMCC has been completed. Our long term ecological monitoring program is collecting valuable data and assisting with long term management actions to improve aquatic and riparian environments. This year our aquatic surveys were expanded to include the Springwood Creek catchment. Data collected over the last 4 years is being included in a scientific manuscript currently in preparation. Additionally, this year we attended the Leura Swamp Fest, held at Peter Carroll Oval in September 2018. 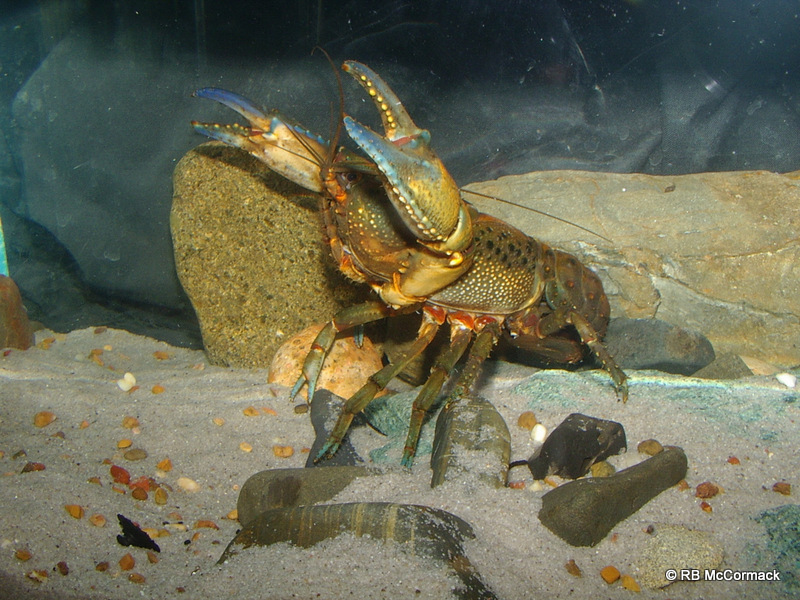 We did a number of presentations “Up Close with Freshwater Crayfish” presenting information on the crayfish species present in the streams of the Blue Mountains and their importance as keystone species. Euastacus gamilaroi. 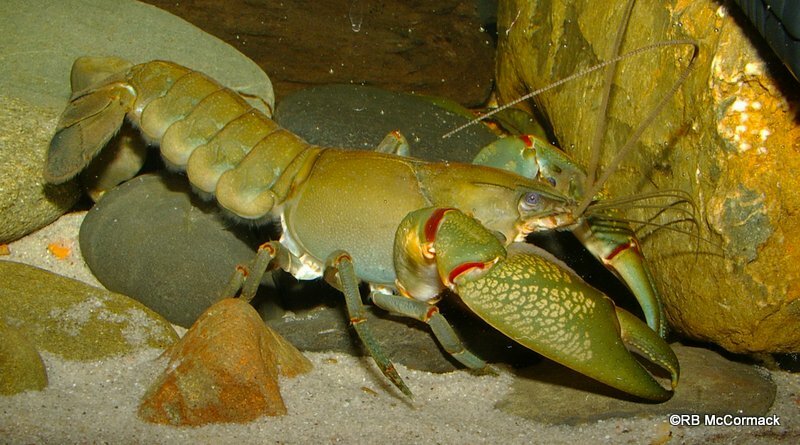 The imperiled Gamilaroi crayfish, Euastacus gamilaroi Morgan (1997), was described from a single specimen collected in 1954 from the vague location of Hanging Rock near Nundle, New South Wales (NSW). Since 1954 no further specimens have been lodged in museum collections or any detailed account of any aspect of the biology and ecology of this critically endangered species. Our current project aims to fill this knowledge gap. Over the year we had 6 expeditions gathering information and we intend to finalize and publish our findings in 2019. As part of the Australian Crayfish Project, AABio sponsored an expedition to Cape York in July and August. This was an extremely productive expedition with a vast amount of knowledge gained that will take several years to be fully utilized. Two new Cherax species and a number of papers on known species are currently in preparation. No scientific papers were published this year but several are nearing completion. 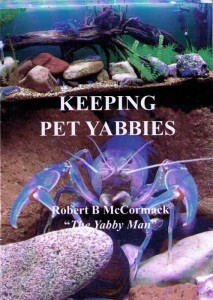 No new books published this year, however, Keeping Pet Yabbies has been updated with a new edition. 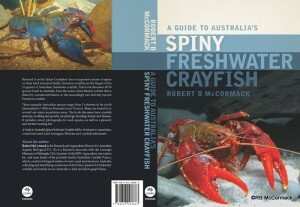 A guide to Australia’s Spiny Freshwater crayfish continues as a best seller this year. Net and traps sales continued this year with strong demand for commercial nets. 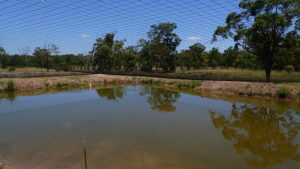 The 14m super yabby trap continues with strong demand. We import these traps directly from the manufacturer in China and we only sell the heavy duty trap with the extra heavy duty cod end. This makes the traps expensive to purchase but if you want a trap you can use commercially every day year after year then these are the traps for you. Unfortunately, there are some very cheap, light weight 3.2 metre similar traps on the market that don’t catch much or last any time at all, “Buyer beware” “You only get what you pay for”. Opera House trap sales have also gone through the roof this year. Commercial traps with no rings are the big seller. 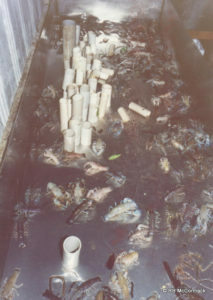 These type traps catch and retain far more yabbies than normal traps with a ring. We sell both a light duty and an extra heavy duty style trap. The extra heavy duty are the ones in huge demand by both commercial crayfish farmers and commercial fishers. Commercial fishers fit their own rings to these traps. (BUY TRAPS) We have had a great deal of difficulty securing supply of these traps in any quantity from our traditional manufacturer that charges an arm and a leg for them. The two attempts with alternate Chinese manufacturers were both a failure as the sample trap they manufactured and sent to us were not to our specifications or an acceptable standard. A warning for all you commercial crayfish farmers that like using opera house traps. 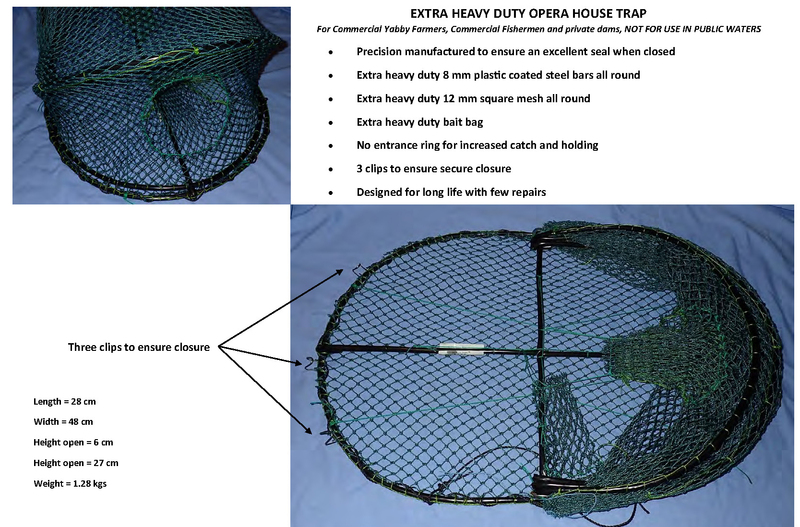 All opera house traps are made overseas, we have had great difficulty dealing with manufacturers as opera house traps without rings are banned in Australia for recreational fishing and even ones with rings are banned in States like Victoria. If the anti opera house trap lobby has their way they will be completely banned from import into Australia. I expect it is only a matter of time before opera house traps will no longer be available, you should stock up now whilst you still can. The large opera house traps NO RING have also seen a huge surge in sales. 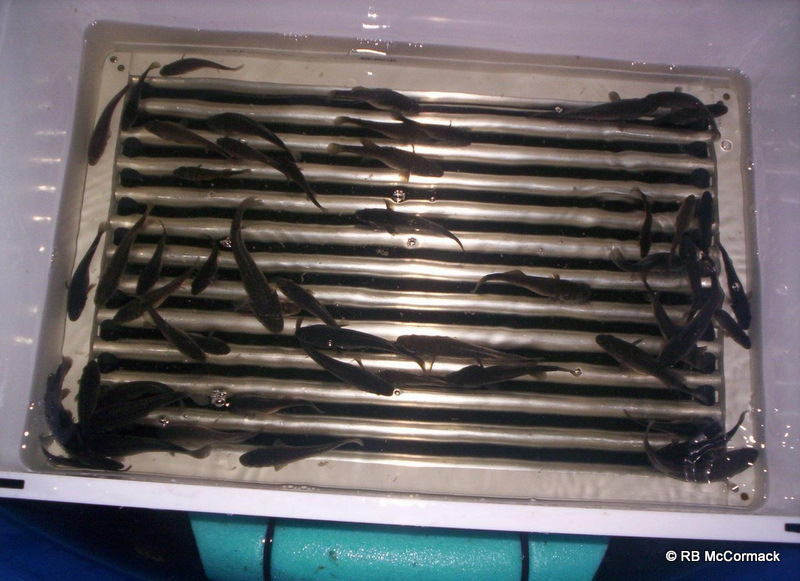 Traditionally used to catch eels from farm dams, more and more commercial fish farmers are using them to catch fish from farm dams. Murray Cod, Carp and Silver Perch farmers are snapping them up. Again, these are traps that may not be available in the near future. 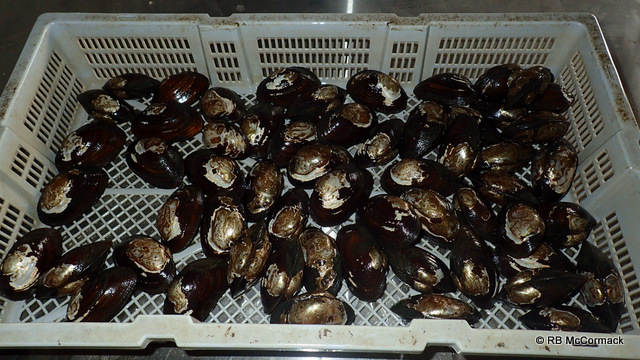 A quiet year for Mid West with only small amounts, less than 250kgs of yabbies being traded. This will increase in future years, a new holding and purging facility is currently under construction as part of the AustSilvers development. 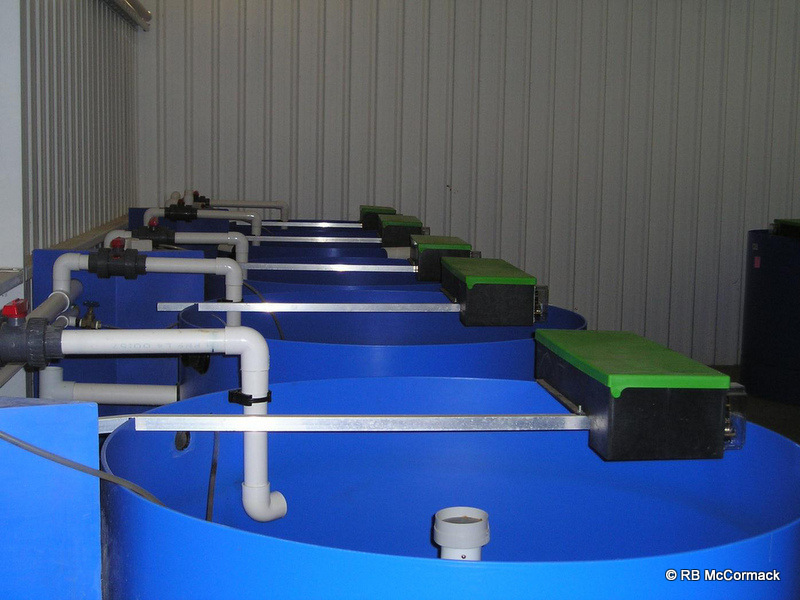 Stainless steel holding/purging tanks are being utilised, these tanks are available as a speciality item through the RBM Aquaculture website. 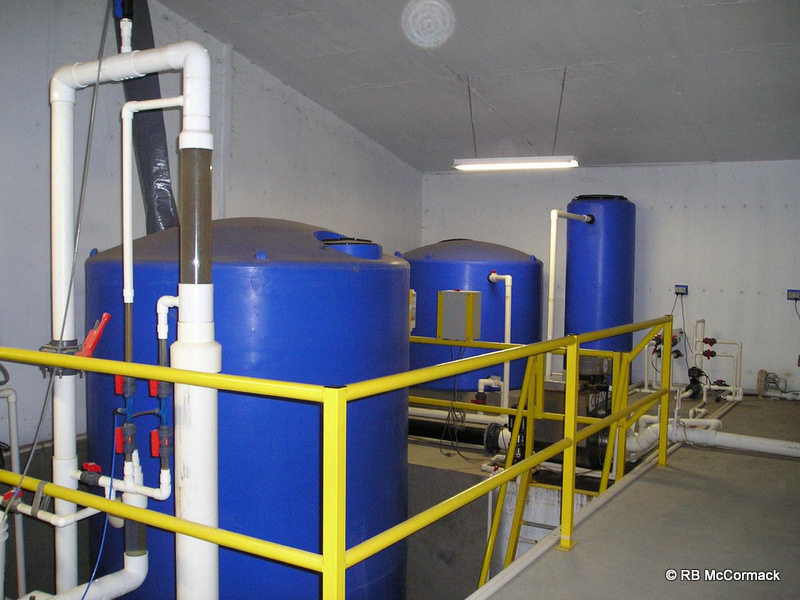 Stainless steel tanks are 2000mm x 800mm floor with a 200 mm wall x 1.5mm 304 Stainless Steel with a 25 mm BSP drain.These are purging/holding tanks are $385 each plus GST ex Sydney or Swan Bay (2424) NSW. Just send me an email if you want any, typically, they are supplied to our consult customers but happy to sell to anyone. Construction of AustSilvers aquaculture facility began in late 2017. We have had a full year of development and construction occurring but we are still a long way from completing. This is a full aquaculture development being constructed from scratch. Stage 1 ponds have been constructed. Each pond is gravity drainable, with its own independent water and air supply. 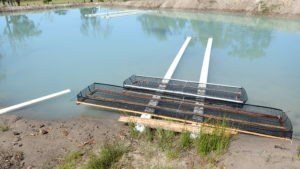 The fish hatchery has been constructed and is in production with breeding of Silver Perch Bidyanus bidyanus being successfully achieved in the new hatchery. 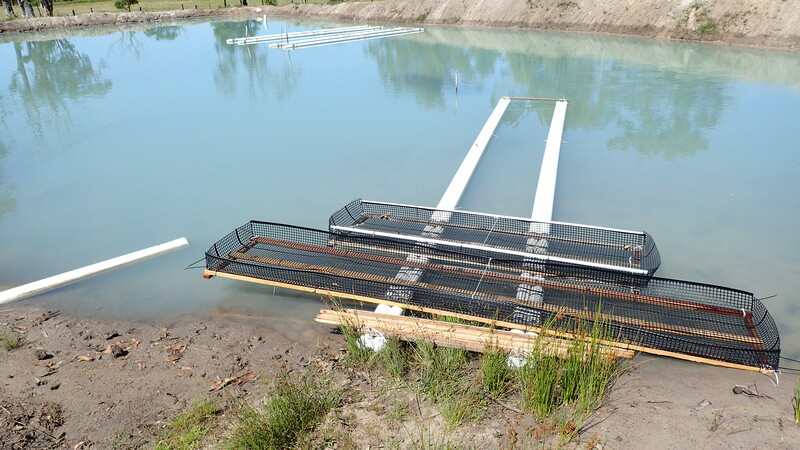 Freshwater mussel culture is well underway, both bottom holding trays and floating cages have been constructed and installed in the Silver Perch broodstock ponds. Each of the 2 current broodstock ponds holds 10,000 mussels. 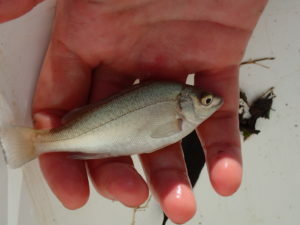 The Silver Perch broodstock act as the host for larval mussels and some mussel breeding has occurred in 2018. Mussels sales for private farm dams and koi ponds has been strong with over 12,000 sold this year. The mussels are also part of a freshwater pearl project, however, the construction of new facilities has consumed all our efforts and no further progress was made this year on pearl culture, however, the infrastructure is being developed ready for the future. In 2017 the Hunter Region of NSW was suffering from the worst drought in 50 years. In late 2017 my local creek at Port Stephens dried up for the first time in the last 18 years since I’ve been here. As the water dried out, I took the opportunity to investigate all the species that occur in my creek. The shallows of the creek dried rapidly but the deeper pools retained water through most of the 2017 period. Interestingly, I observed freshwater mussels moving from the shallows into the deeper water. They use their foot which is tongue like to push themselves along. This leaves a trail in the sediments which you can easily follow to the mussel. I was quite surprised by the sheer number of them that were in my deeper pool that I would normally use as a fishing and swimming hole. Typically its over 3 metres deep but the drought saw it shallowing to less that 300mm. 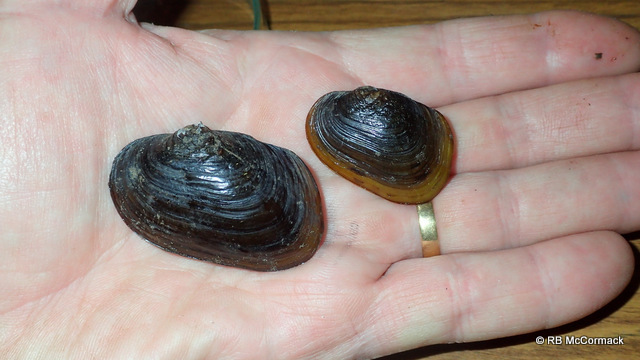 Freshwater mussels are great indicators of your streams health. They are sensitive to pollution and sedimentation so if you have healthy populations, your stream is more than likely healthy. The water in the bottom of my pool was clear, warm and shallow so I decided to survey the freshwater mussels in it. I systematically, worked my way by hand through the bottom sediments, feeling for mussels and counting them. Interestingly, I found around 2600 mussels in the pool. That’s great news and indicates my creek is generally health and has been so for quite some time. Mussels are very long lived 20-40 years and these were a good mix of small to large old mussels that I was finding, indicating healthy conditions for many years. Unfortunately, I’m not a freshwater mussel expert but I have spent some time over the years with experts helping them collect mussels for identification. The mussels I found were all very similar in size, colour and shape. However, if you looked closely, occasionally, I would find something different. The most common and abundant freshwater mussel was Hyridella drapeta. Interestingly, in amongst the 2600 mussels were around 160 different ones, these were Hyridella australis. They look very similar but if you look closely they have v-shaped sculpturing on the beaks of the shells. 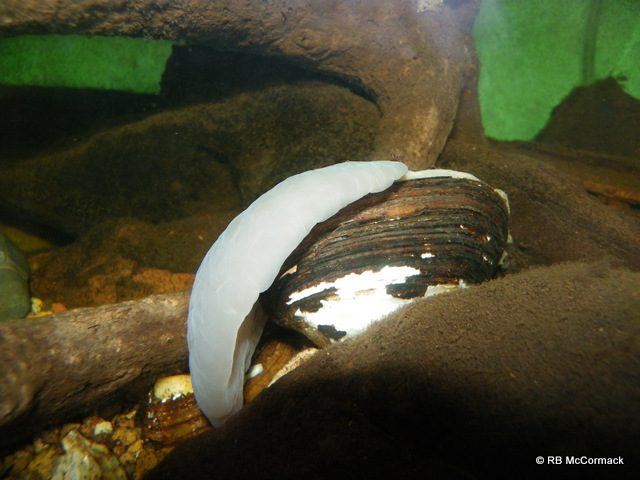 Freshwater mussels are natural biofilters processing large volumes of water. 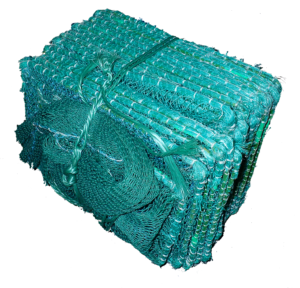 They remove large quantities of nutrients, algae, bacteria and organic matter which helps to clean water bodies. 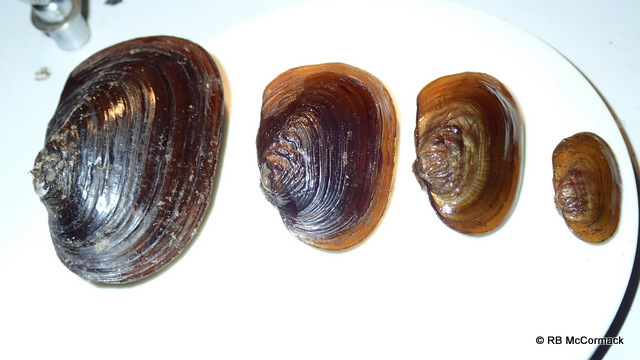 Both H. australis and H. drapeta are classed as river mussels. They need permanent and flowing water to breed and survive so generally found in permanent flowing streams. 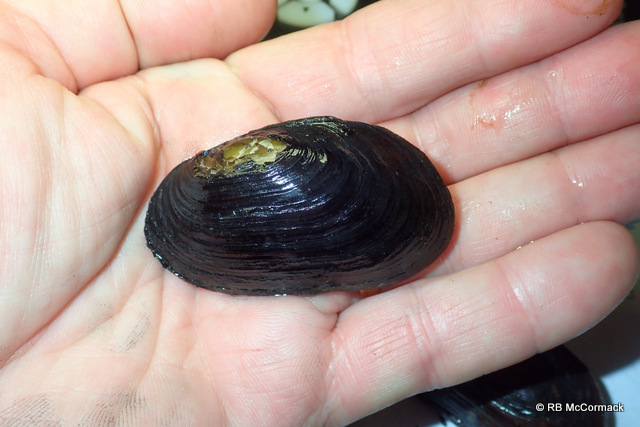 Many people want freshwater mussels for their fish ponds or farm dams to help keep them clean. River mussels are not suitable and will eventually die in a static water dam or pond. However, there is one species that thrives in static water dams and ponds. That’s the flood plain mussel Velesunio ambiguus. This mussel will live and breed up to huge numbers in your ponds and helps to keep your water clean. This is a commercially, cultured species so available for purchase from aquaculture farms like AustSilvers or if you just want one or two for a fish tank then check with your local aquarium shop. BTW, If you want to start a sustainable population going in a farm dam you will need several hundred as initial stock. 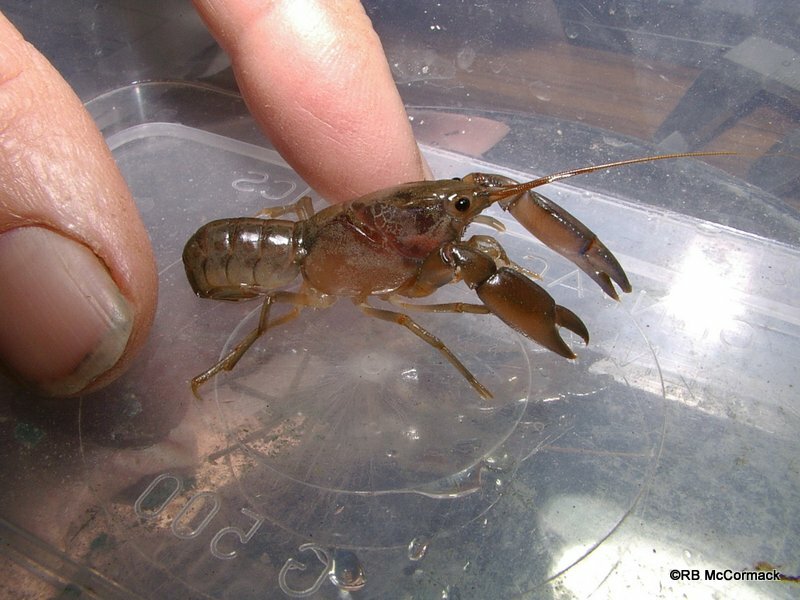 Freshwater blood and fluid sucking leeches can pose a serious problem for freshwater crayfish. Typically it’s the common yabby (Cherax destructor) that you find leeches attached to or they have a nasty round scar indicating a leech has had a feed. The scar remains until the crayfish moults but the scar itself can create difficulty in moulting and can lead to the death of the crayfish. 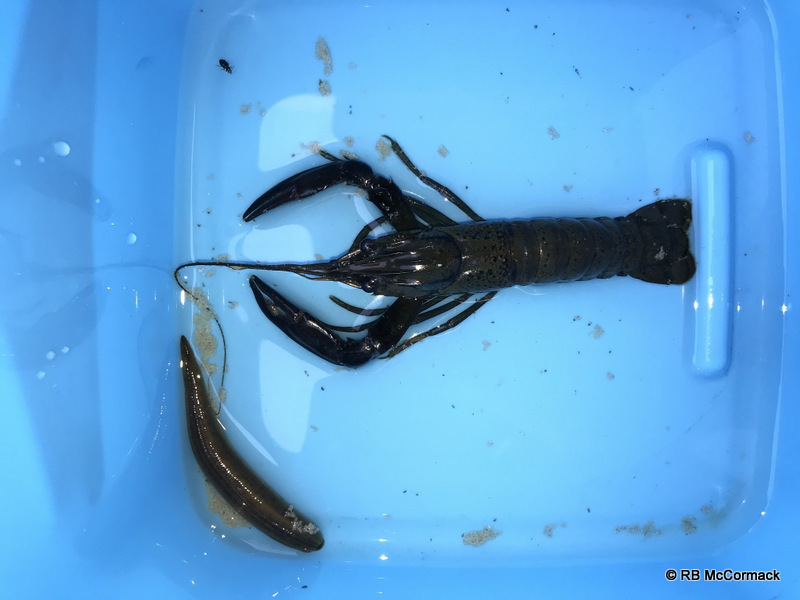 From an aquaculture perspective, leeches in your ponds are a big NO-NO and every effort should be made to catch and remove them as the unsightly scars on crayfish make them unsellable. Most leeches can ingest several times their own weight in blood at one feeding and swell to a large fat size. Leeches attach to their hosts and remain there until they become full, at which point they disengage and fall off to digest their huge feed. 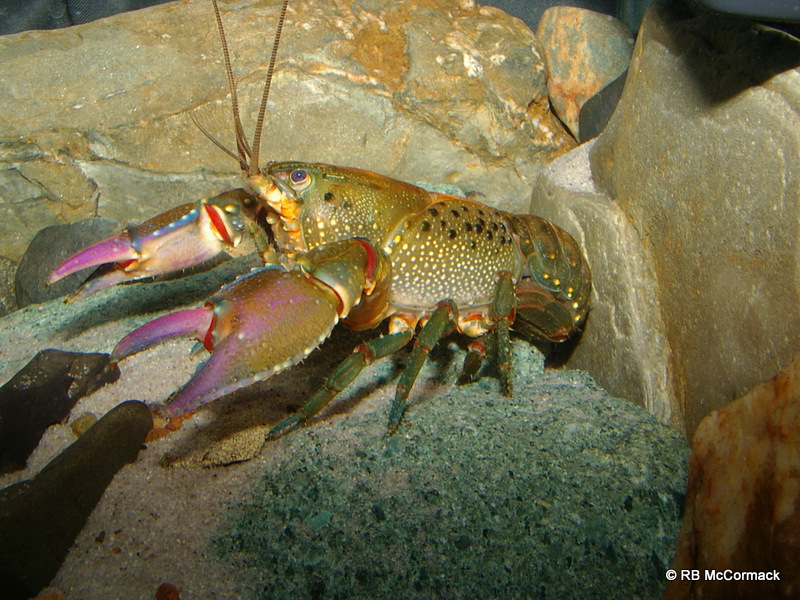 Crayfish are most vulnerable when they are freshly moulted. 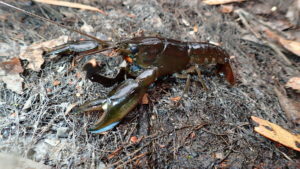 Freshly moulted crayfish are already stressed out and weakened by the moult process, the additional blood loss from a leech feeding could be fatal. 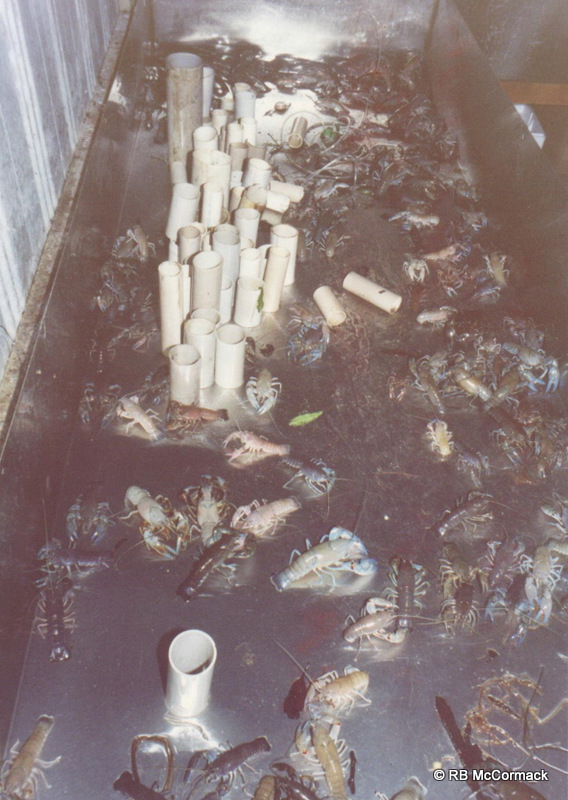 This risk of mortality is greatly increased if the crayfish is small and the leach large. The example Marron with a leech attached was found in the swimming hole below North Dandalup Dam, WA.